Following two strong quarters of economic activity, U.S. real GDP growth for Q4 2018 and for all of 2019 appears to be slowing towards the economy’s long-term trend rate. On a year-over-year basis (q4/q4), real GDP growth is forecasted to slow from a 3.1% pace for 2018 to 2.2% for 2019. Reduced impact from the tax cuts and fiscal stimulus are reasons for the forecasted slowdown. Consumer spending, which increased around 2.8% in 2018, is projected to moderate to 2.4% for 2019. A strong labor market and rising wages should continue to support spending. Also driving the slower growth projection for 2019 is weaker business spending/investment. Recent declines in business sentiment suggest manufacturers and service-sector businesses are becoming less confident with the economic outlook. Additional downside risks to growth include a Fed policy mistake, slowing global growth, trade tensions, and geopolitical risks. We are calling for below-consensus GDP growth in 2019 as we view the risks to growth as skewed to the downside. We do not expect the U.S. economy to fall into a recession in 2019. The Federal Reserve seems to have become more dovish as downside risks to economic growth have increased. Recent comments from Fed officials suggest they will be more “patient” with future rate hikes, with Fed policy becoming more data dependent. We believe the Fed will be closely monitoring incoming data for signs of increasing inflation (CPI, core PCE), strengthening labor markets (unemployment rate, wages), increases in market based inflation expectations (forward breakeven rates), and increases in survey based measures of inflation (ISM prices paid, consumer inflation expectations). With economic growth slowing and inflation expected to remain near the Fed’s target of 2%, we expect them to increase the Fed Funds target range one time this year, or 25 basis points. Treasury yields, according to consensus forecasts, are expected to move modestly higher from current levels. The benchmark 10-year Treasury yield is forecasted to end 2019 at 3.15% based on the median forecast among economists. The yield spread between the 10 year and 2 year Treasury notes is expected to remain in a tight range of 20bps. We are calling for the 10 year Treasury yield to end the year modestly higher but below 3%. Exhibit 1 lists our risks to U.S. GDP Growth, Inflation, and Treasury Yields. 2018 – Going into 2018 we anticipated the Fed to raise the Funds rate, causing the economy to slow and the yield curve to flatten. The Fed raised the Funds rate by 1.0% with the final nail in the coffin coming in December. We saw the economy slowing in Q4 which, when coupled with apparent Fed indifference to the current state of the economy and the market’s gyrations, caused a significant selloff. In December, equities fell, credit spreads widened, and we finished the year with losses and uncertainty across a number of sectors. 2019 – We expect that the Fed will have significantly less impact on the markets in 2019. Recently, they have indicated more of a “wait and see” approach while the market is pricing in zero rate hikes for 2019. Just as investors could only see bad news after the December 19th Fed meeting, it seems that there is nothing but roses since the new year. Our expectation for interest rates is that the yield curve will not invert, and 10 year Treasury yields will stay below 3.0%. There are number of risks to this benign forecast that include but are not limited to: failed Chinese tariff negotiations, stalling economic growth in Europe, a hard Brexit, or a spike in wage driven inflation. AAM expects that 2019 will be a positive environment for spread product and equities. However, given the potential impediments to growth, risk assets are NOT attractive enough to aggressively overweight. We recommend that risk allocations be maintained at a conservative level in order to allow flexibility to add should the markets stumble. Once again, we anticipate individual security selection and a focus on risk will prove to be the right call in 2019. 2018 was a disappointing year for the markets despite record revenue and profit growth. After a period of credit creation in 2016-2017, the unwind of QE programs and higher rates caused a sharp slowdown in credit creation from both the private sector and central banks in 2018. The Investment Grade (IG) market also suffered from idiosyncratic events related to GE, Goldman Sachs, Comcast, PCG and the tobacco companies. The spread to Treasuries for the IG market (OAS) closed the year 60 basis points wider with BBBs and longer maturities underperforming. We expect revenue and EBITDA growth rates to decelerate in 2019 to approximately 5% and 8% respectively on average. Capital spending is also expected to decelerate to 2-3%. Debt leverage for IG companies on aggregate changed very little in 2018, but given the focus on debt by the equity community and rating agencies today, we expect companies with over-leveraged balance sheets to work more proactively to reduce debt leverage in 2019. However we do not expect this to be widespread since: (1) lower growth rates make it more difficult to reduce leverage organically, as the equity market has become accustomed to companies using the majority of their excess cash to repurchase stock, and (2) historically, the C-suite does not get more aggressive with credit improvement unless the cost of debt approaches the cost of equity, which has not yet occurred. Therefore, we believe material fundamental credit improvement will be challenging in 2019, with companies facing uncertain growth outlooks and higher costs (labor, transport, interest, trade). From a technical or supply/demand perspective, we expect net supply of IG bonds to be down materially in 2019 due to the high level of debt maturing, and gross debt supply to be down modestly. This environment of uncertainty/volatility does not support increased M&A activity, and despite improved economics from year-end 2017 (i.e., the spread between earnings yield and the after tax cost of debt), we would not expect an acceleration of debt financed share repurchase activity. Therefore, net supply should be related to refinancing upcoming maturities and tendering others. We believe the demand for IG debt could be lackluster again in 2019 due to higher short term rates and the shape of the Treasury curve. Therefore, we expect another year of less supportive technicals. Valuations have improved with the IG OAS widening to a point at year end 2018 that reflects an approximate 25% probability of a recession, and the spread premium for BBBs vs. A/higher rated securities widening towards its historic average of 88 bps. Our credit cycle signals related to the shape of the Treasury curve and access to funding have weakened but do not flag the end of the credit cycle. However, given our economic outlook which has risks skewed to the downside, we do not consider current spreads to be “attractive.” Therefore, we would recommend maintaining a neutral position vs. a benchmark in the IG credit sector, investing cautiously in the asset class, preferring shorter duration bonds, sectors with stable cash flows through the economic cycle, and credits we consider to be higher quality from a balance sheet perspective. We have a constructive view on the following sectors: Banks, Pharmaceuticals, Midstream, Capital Goods, Food/Beverage, and Insurance. On the contrary, we are concerned with the fundamental performance of: Chemicals, Cable, Autos, Tobacco, Consumer Products, and lower quality Media credits. It is important to stress that security selection is critical at this late stage of the credit cycle. Our market and sector outlooks are supported by expectations of: (1) positive albeit lackluster economic growth in the US and EU (2) geopolitical events (i.e., trade talks with China, a hard Brexit, and Italy leaving the EU) remaining at a simmer point (3) Federal Reserve pausing its rate hike cycle. 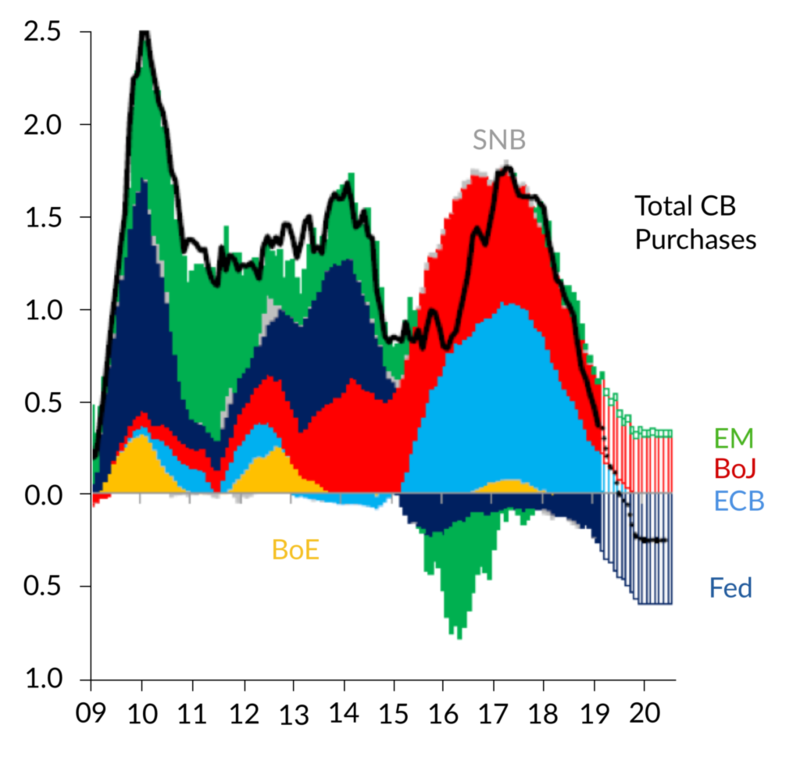 If growth disappoints, the biggest upside surprise for all markets would be a reversal in the unwind of various QE programs to support and stimulate growth. We are not assigning a material probability to that in the US in 2019, since the labor market is far tighter than it was three years ago with unemployment below the natural rate. With the exception of shorter duration Asset Backed Securities (ABS), structured products performed relatively poorly in 2018. The prospect of slowing domestic growth and dislocations in global trade caused risk assets to underperform less risky Agency and Treasury securities. We’re cautiously optimistic that structured securities will perform better in 2019, although we do anticipate a fair amount of volatility over the course of the year. We expect non-agency mortgage backed securities, Commercial Mortgage Backed Securities (CMBS), and consumer backed ABS securities to outperform lower risk assets. Agency Residential Mortgage Backed Securities (RMBS) experienced their worst yearly performance relative to Treasuries since 2011 as spreads widened 25bps. Unlike in prior years when Federal Reserve asset purchases materially reduced the available supply of RMBS, balance sheet normalization which began in the second half of 2018, will provide an incremental $170b to $180B of supply which the market will struggle to absorb. Traditionally, domestic banks have been big purchasers of agency RMBS, but with the relaxation of liquidity rules for small and mid-sized banks and since money managers have generally been avoiding the sector, we don’t see the market being able to absorb the supply without some spread concession. In the most recent release of the FOMC minutes there was some discussion of selling securities from the mortgage portfolio, but we do not believe the Fed will follow through with any sales. Given the poor technical environment, we favor allocating investments elsewhere within structured products and to other spread sectors. Non-agency RMBS still represents an attractive investment option. Credit fundamentals in the sector still look very good and since underwriting continues to be very conservative, we anticipate the sector outperforming agency RMBS and to a lesser extent Treasuries this year. Housing price appreciation should slow to roughly 3.5% as compared to levels of 5% and 6% in prior years; however, we don’t anticipate that it will negatively impact the market. With the consumer being in such excellent financial shape due to low unemployment of 3.9% and wage growth of 3.2%, delinquency and default rates should remain at very low levels. 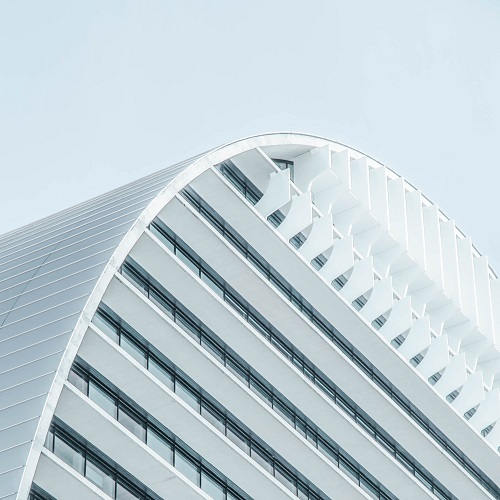 Commercial real estate fundamentals remain in relatively good shape following multiple years of property price appreciation and domestic economic strength. Conduit CMBS supply is estimated to be $70B this year which should prove to be very manageable including only $7.5B of maturing conduit loans in need of refinancing. 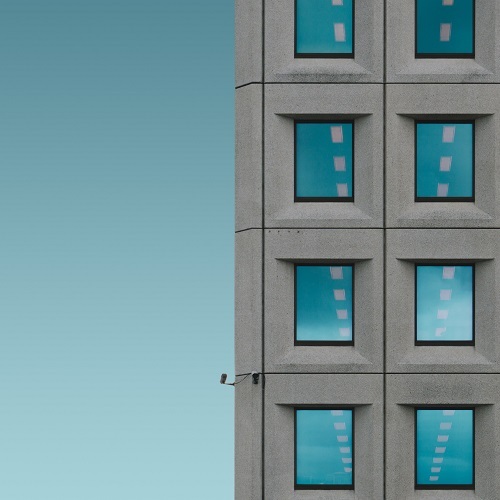 Ordinarily this type of environment would lead us to conclude that CMBS spreads should tighten in 2019, however, we see more risk to the CMBS market from global economic risks and trade dislocations rather than technical and fundamental factors. Spreads of senior conduit CMBS securities tend to track single A rated corporate bonds fairly closely and we’re anticipating heightened volatility within the corporate sector this year. We expect spread levels to closely track corporate bond spreads but with slightly less volatility which should allow them to modestly outperform Treasuries and single A corporate bonds. Our investment of choice within the sector continues to be conservatively underwritten single asset transactions with low leverage. As in prior years we remain concerned about the retail sector, particularly regional malls in less populated areas, which must be carefully analyzed in any conduit securitization. ABS was the only structured products sector to outperform Treasuries last year, and we believe they will outperform again in 2019. Healthy consumer balance sheets due to strong job growth and healthy wage gains will support credit performance. We’ll continue to maintain significant portfolio weightings in the asset class particularly in structures backed by consumer receivables. High credit quality and stable cash flows make ABS an attractive alternative to short Corporate Credit, Taxable municipals and Treasuries. Our favorite sub-sectors continue to be prime and some select subprime auto, credit card, and equipment transactions. We are maintaining a constructive bias for the tax-exempt sector. During the tumultuous level of volatility that stressed the capital markets during the latter half of 2018, the municipal sector held its ground and performed very well due to very favorable technical conditions. 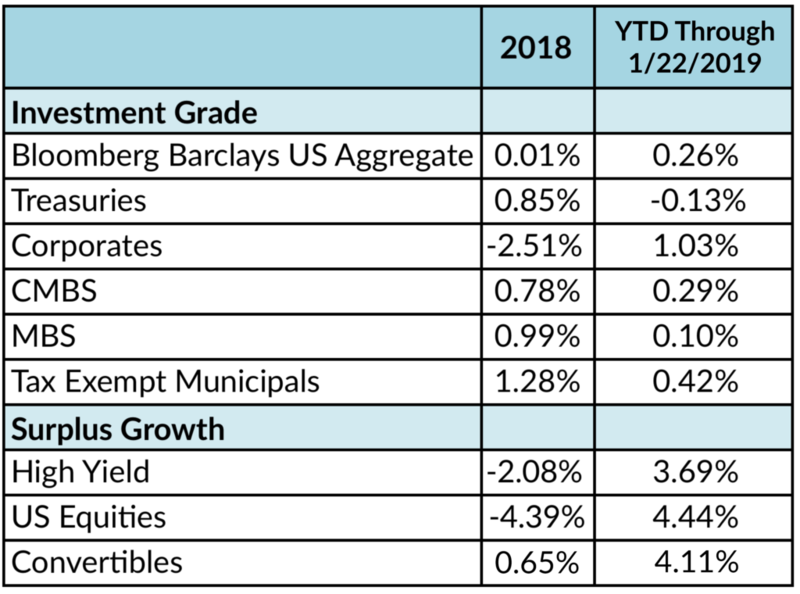 As we enter 2019, we remain constructive on the sector due to similar themes that are expected to see municipal relative valuations continue to improve, especially in the near term. Tax-reform will once again play a large role in providing a solid technical environment for the tax-exempt sector. The Tax Cut and Jobs Act (TCJA) that passed late in 2017, eliminated the use of tax-exempt advanced refundings, which is a process that allowed issuers to effectively refinance their debt more than 90 days before the actual call date. Its absence resulted in a year-over-year decline in issuance of approximately $100 Billion during 2018 to $339 Billion and, in 2019, its repealed status will continue to suppress supply conditions. We expect to see only a 10% increase in new issuance to $375 Billion, and that level would be 14% below the average annual issuance produced in the three years before tax reform was implemented. On the demand side, reinvestment flows of coupons/calls/maturities are expected to remain sizable during the year and provide ample support. The record level of refundings that were executed from 2015 to 2017 is expected to result in a large number of maturities during the year that will lead to net supply levels of negative $69 Billion. 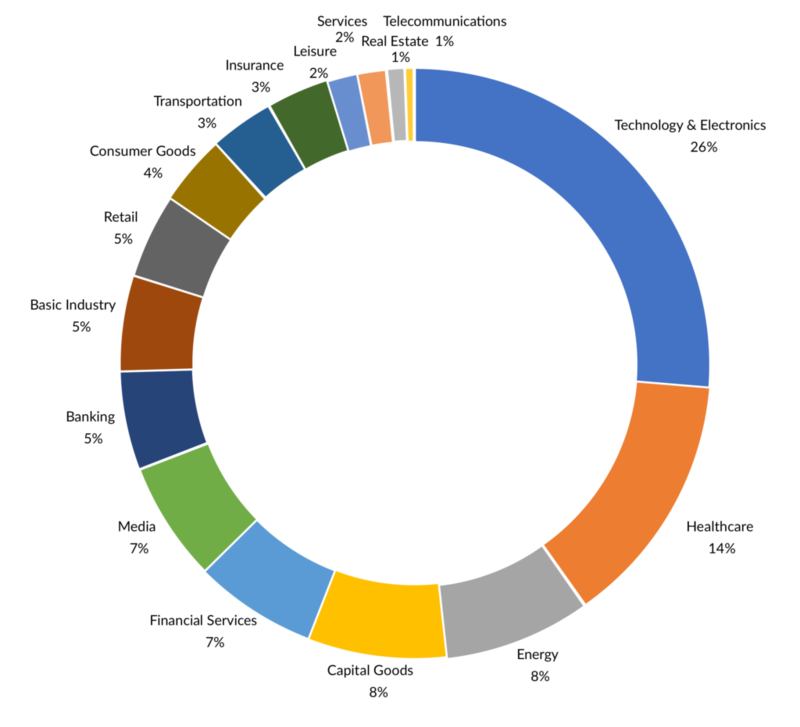 Although that’s not as extreme as the negative $121 Billion in net supply during 2018, it should remain as a major underpinning to the sector’s solid relative performance during the year. In looking at the different market segments of demand, we expect that the muted investment behavior from institutional investors (primarily banks and insurance companies) in 2018 will continue to be in play during 2019. Municipal tax-adjusted yield levels at the new 21% corporate rate remain below that of Treasuries inside of 10 years and are well below that of taxable spread product across the yield curve. The Federal Reserve’s Flow of Funds data reported that banks reduced their exposure to municipals by approximately $40 Billion during the first three quarters of 2018, and we expect to see more right-sizing of institutional portfolios during the course of 2019. However, we are also expecting the retail segment to remain fully engaged in the market. These investors will be flush with cash from reinvestment flows, and tax-adjusted yield levels for investors in the highest tax bracket of 40.8% (37% plus 3.8% Medicare surtax) look very compelling versus taxable alternatives. At the start of the year, grossed-up yields of tax-exempts were 116 basis points north of Treasuries in the 10 year maturity and were at comparable levels to corporates in maturities 10 years and shorter. Additionally, we do not expect any headline risk to create selling pressure in the space, as we expect credit fundamentals to remain solid during the year. Individual and corporate tax revenues have been growing at a robust rate during 2018 and are expected to continue going forward. That should bode well for solid fiscal performance for state and local governments. For our insurance portfolios, we believe that tax-adjusted yield levels remain unattractive versus taxable alternatives. However, the relative slope of the municipal curve remains steep from 2 to 20 years and we view the 11 to 20 year relative curve steepness as attractive. We will continue to look at underweighting the sector into any relative outperformance in favor of taxable alternatives that provide a better after-tax yield profile. Stronger than consensus economic growth that would lead to even stronger tax revenue growth. 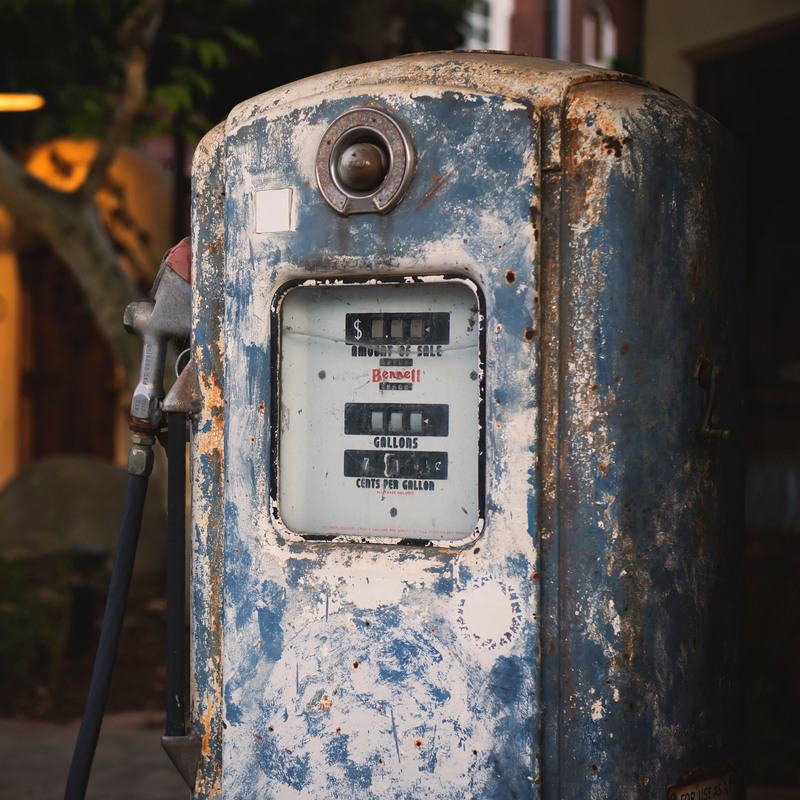 A continued downward move in oil prices could pressure the fiscal performance of the heavy oil-producing states. Sharply higher Treasury rates could lead to heavy mutual fund outflows. Potential passage of federally-sponsored infrastructure spending that leads to higher-than-expected new issuance. After credit spreads fell to a post financial crisis low in early October, the high yield market re-priced significantly in Q4 2018 with spreads widening 223 basis points (bps). This resulted in returns of -2.08% for that year. To put that in perspective, 2018 marks only the 7th time in 35 calendar years of index data the high yield asset class experienced negative total returns. Broad market yields ended the year at 7.95% with credit spreads at +526 bps, both metrics exceeding their 5 year average. Valuations for the sector have become more attractive given the underlying fundamentals as 2019 default rates are expected to remain below the long-term average. Unlike the investment grade market, high yield issuers have generally deleveraged their balance sheets since 2015, as evidenced by a continued positive upgrade/downgrade ratio and the percentage of CCC rated issuers in the market, which has declined to a decade low at 13% of the index. Further, interest coverage ratios remain high, and the level of future debt maturities to be refinanced is manageable. Note: 2018 data is through November 30. Technicals for the asset class are supportive as the high yield market debt outstanding has been shrinking since 2016. New issue supply for High Yield was $187 billion or -43% year-over-year which was the lowest volume since 2009. 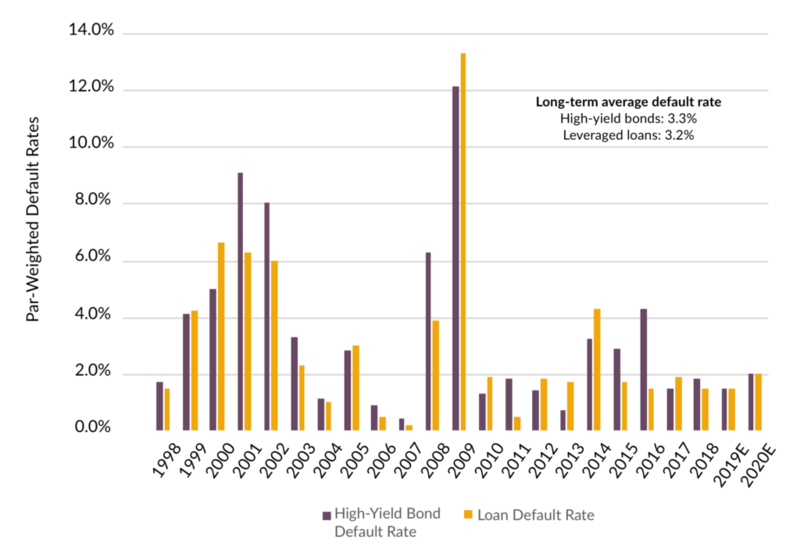 In contrast, the loan market has been a funding alternative for high yield corporates, as issuance of $697 billion ranked as the second highest annual total on record despite a 28% drop from 2017. It bears watching that acquisition-related issuance has drifted higher to 21% of volume, but that level remains below the long-term average of 24% which is well below the highs of over 50% in 2007. Additional headwinds for the sector will likely persist if macroeconomic declines exceed expectations. Increased hedging costs have weighed on foreign demand as US monetary policy has diverged from global central banks, and further rate hikes would likely extend this trend. A recession could also impact valuations as BBB issuers are downgraded to high yield, increasing supply. However, higher yields and spreads overall improve break-evens and provide more downside protection around interest rate risks and potential credit concerns. We continue to believe credit risk is best managed with an active approach that emphasizes credit quality and diversification to reduce risk in portfolios. Long-term investors with the ability to act as liquidity providers to the market during periods of volatility are likely to be rewarded. While convertibles outperformed most asset classes in 2018, the year is best viewed as two distinct periods – the first nine months of the year, and the last three months of the year. First quarter 2018 through the third quarter saw a continuation of the longest equity bull market on record, and many convertibles moved further “up the curve” becoming ever more equity-like. However, the market capitulation in the fourth quarter highlighted the lack of downside protection afforded by equity-like convertibles. As some individual stocks dropped by a magnitude of 50% or more, equity-like convertibles linked to those shares fell virtually in lockstep with the underlying stock price. 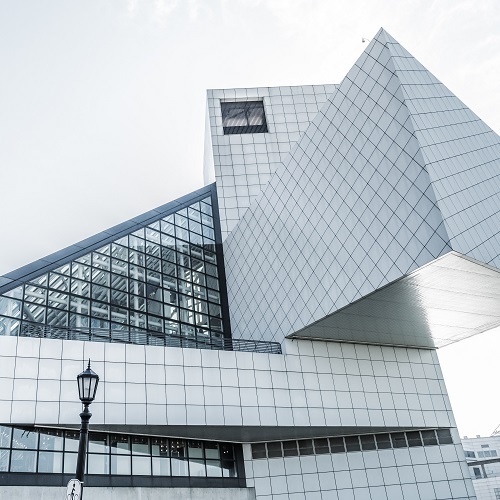 Balanced convertible portfolios, on the other hand, offered downside protection during the fourth quarter as bond floors held up and provided support. In the aggregate, balanced convertibles did their job in 2018, providing upside participation as equities climbed during the first three quarters, and delivering downside protection as markets fell in the fourth quarter. Over a complete market cycle – which we have not seen in nearly ten years – we expect the “ratchet” effect provided by balanced convertibles will result in equity-like returns with less volatility. U.S. primary market activity was strong with convertible issuance of $53 billion during 2018. That made 2018 the biggest year for convertible issuance since 2008 (when issuance was $59 billion). 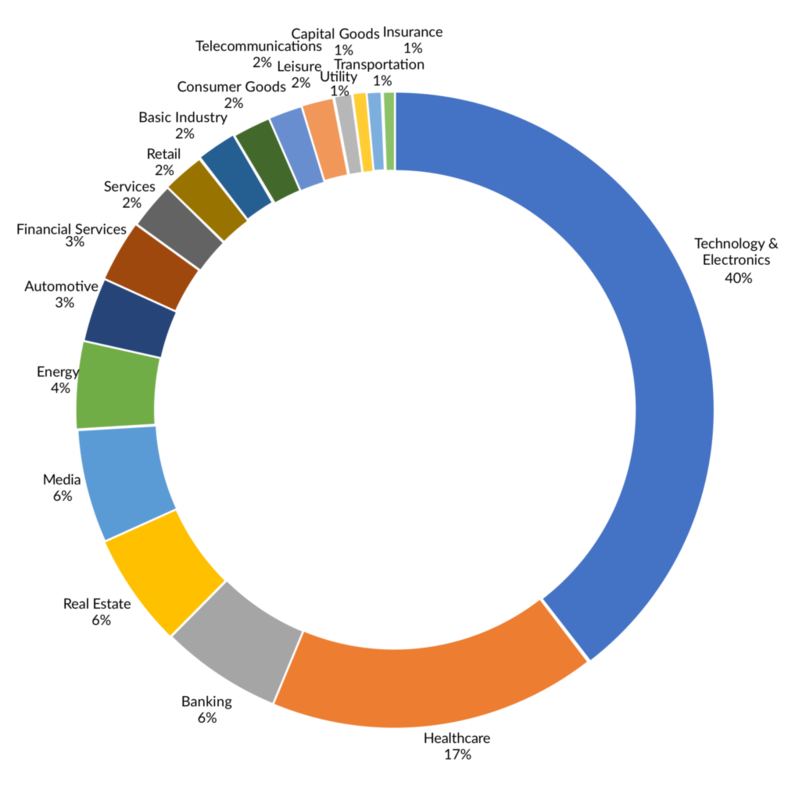 The Technology and Healthcare sectors represented 60% of new issuance at 43% and 17%, respectively. Convertible issuance combined with the fourth quarter equity market decline allowed us to counteract two fundamental issues associated with the convertible market today: technology sector concentration and equity sensitivity. The sector breakdowns below highlight the Technology concentration in the broader market (using the V0A0 index as a proxy) versus a balanced convertible composite (using the Zazove Associates Blend Strategy Composite as a proxy). Further, the weighted average investment premium (a measure of downside risk exposure) of the V0A0 Convertible Index is 49.4% versus 20.5% for the Zazove Blend Composite. For investors in convertibles, active management of portfolio investment premium mitigates downside risk and leads to superior risk-adjusted returns over market cycles. To the extent interest rates continue to increase in 2019, the low duration of convertibles (~2 years or less) will insulate our portfolios from the headwinds typically associated with a rising interest rate environment. Further, if the fourth quarter of 2018 portends renewed 2019 market volatility that would be a positive development for investors in AAM/Zazove balanced convertible strategies. As an active manager of balanced convertible portfolios, volatility provides abundant trading opportunities and allows us to rebalance, take advantage of attractive valuations, and continue to optimize portfolios. As an aside, volatility increases the value of the embedded option of convertibles. The opportunity set and trading environment for convertibles is as strong as it has been in years, and we are excited about the prospects for 2019.